Weekly Theatre Academy in Surbiton for ages 7-15! TOPIC: Weekly Theatre Academy in Surbiton for ages 7-15! We have two weekly academy classes running from September at Hook Evangelical Church. Both our academy classes run as weekly workshops where we focus on a range of elements of theatre from improvisation to script work to comedy to backstage work. As well as weekly workshops, some terms may be ran as rehearsals for productions to be performed at the end of term. 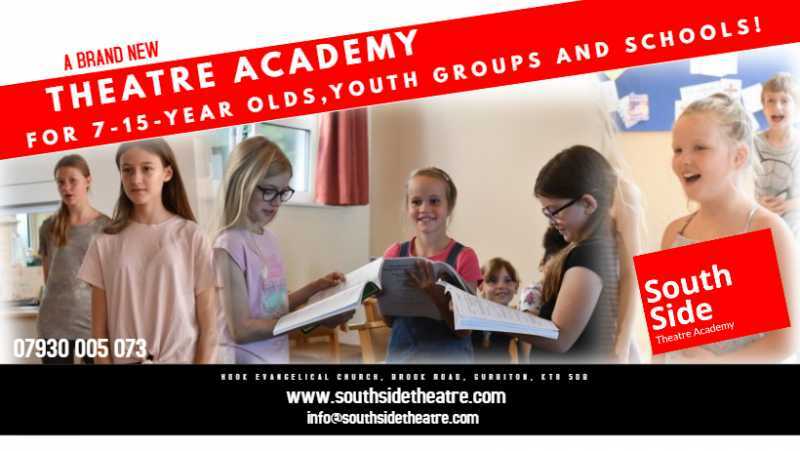 South Side Theatre Academy launched in May 2018 with an aim to create top drawer theatre workshops and shows in Surbiton for young people, giving them the opportunity to experience all elements of theatre at affordable prices. We run weekly theatre workshops for 7-15-year olds, holiday projects, school and youth club projects and productions, with our sole aim to open out top quality theatre education to everyone. All our workshops and rehearsals take place at Hook Evangelical Church.